Watch out! Harley Quinn™ is hitting town! Here comes Harley Quinn in her big-wheeled hammer-slammer truck! Can Batman’s high-speed Batcycle dodge her pavement-pounding mechanical mallet and put an end to the mischievous jester’s crime spree? Fire the missiles and find out! Includes Batman™ and Harley Quinn minifigures! Batcycle features black wings and flick-fire launchers! Turn the knob on the back of Harley Quinn's truck to slam the giant hammer back and forth! Harley Quinn's truck has flick-fire missiles! Batcycle measures over 4" (10cm) long! Harley Quinn's truck measures 7" (18cm) long, 4" (10cm) wide and has 2" (5cm) wide tires! 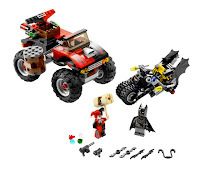 WIN a LEGO The Batcycle™: Harley Quinn’s Hammer Truck Set !!! Visit LEGO , then leave a comment letting me know which other product you like. One winner will be chosen! I will be using a random number generator to select the winner.Contest ends at 11:59pm CST on Sunday February 8,2009.If the prize is not claimed in 48 hours a new winner will be chosen.Contest open to U.S. residents only.The winner will be announced on my blog(and emailed)Monday February 9,2009. My grandson would love the Power Miners! I love Lego's. 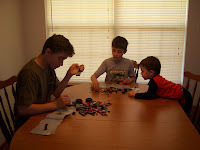 Lego's foster imagination, hand/eye coordination, and spacial skills. I always look for lego's at yard sells. I would pick 7679 from the Star Wars collection. My cousin loves Legos. He loves the Castles Legos and most certainly would love the Harley Quinn's Hammer Truck! My oldest would love anything from the Star Wars collection, he's very into Star Wars right now. I think he would like the Separatist Spider Droid. My boys are all huge fans of Legos!! The 6243 Pirate Ship looks like tons of fun! Lego has always had great products for years. The little ones in my family would be happy with about any Lego product they can get their hands on. I definitely like the Bionicles. Love Legos! My sons are really into pirates, so I have to say that they would love the Pirate Ship. My son loves any of the Star Wars Clone Wars sets. My son would love any of the Star Wars legos. my son just loves Legos. We really like the Mars Missions sets. What a great toy that has been around for years. Who says kids nowadays need all the electronic stuff. Legos are great and let kids use their imaginations! My nephew would absolutely love the Brickbeards Bounty boat since he is a huge pirate fan! We are a huge Lego-lovin' household! My son covets almost every Lego made. Currently he is really into the City series and wants to have the Police Station. The Pirates of the Caribbean set looks like alot of fun. My sons love anything Lego- and Star Wars Lego is the best! We are Legomaniacs here. My aunt got to visit their factory in Denmark. That's my kids' fantasy tour. I'd choose the "Jungle Hideout" from Lego's Creation Lab. The kids could have hours of creative fun with it. Yay for this Lego giveaway! I'm an email subscriber (which is how I discovered this giveaway). I love the City Coast Guard helicopter set. And I'm now a member of the Blue Cult via email. My oldest son (17) wants the gigantic Star Wars one with 5000 pieces! Thank goodness my younger kids (7, 4, 2) have cheaper tastes! I like the 7630 Front End Loader for my little man. My son would love the Pirates Soldiers’ Fort. We love legos!! I like the bricks n more or the pirate set! Legos are a big hit in our house. I think my son would also love the City Police Headquarters. I like Lego's Spongebob Squarepants collection. My kids have the rocket and they love it. I am now following your blog. Thanks! My son Jack is addicted to building the Star Wars Lego collection- especially the AT AT Walker. I love the Duplo Friendly Zoo. Star Wars would be nice. My son would love 7632 Crawler crane - thank you. the City Coast Guard helicopter set. We like the Indiana Jones Flying Wing Plane Item #7683. If we should be lucky enough to win, we would like the Set listed as the prize to be donated to St. Jude's Children Hospital or to a battered woman/children shelter of your choice. Thank you. LEGO STAR WARS: THE COMPLETE SAGA video game. The boys would love this. We love Lego star wars at our house! My son would love any of the Lego products - Huge fan but I think he would really like the 8015 Assassin Droids™ Battle Pack. Thank you! My nephews would love #8291 Dirt Bike. I really like the Star Wars Armored Assault Tank!! I just got the Lego magazine, and was amazed at some of the creations the kids can make! I like the Lego Propeller Power-looks like fun! I have to choose THE PIRATE SHIP. Legos makes the best toys. I love the Indiana Jones legos! I like the Star Wars Assassin Droids™ Battle Pack. Thanks for the giveaway! There's a lot of great Lego products. One of my favorites is 8959 Claw Digger. I like the fact that they also have Legos in the large size, so that little ones can have fun with them before they graduate to the smaller ones and the various sets. My son is starting to love the Clone Wars so he'd like to have Anakin's Jedi Starfighter. Thanks! My wonderful and intelligent grandson just LOVES Lego's products. Thank you for this great contest and prize. My son would love this product - he loves not only Lego's products but Batman products also. Thank you for this really great contest and prize. Happy Valentine's Day! My oldest loves lego's we had to hunt down a Spongebob one for him to use a gift card from Christmas as that was all he wanted. He would love the Spongebob 3834 or 3830 or his other love Star Wars 7673. Thanks for this wonderful giveaway for us moms with boys !! My husband is an architect and says that Legos are great for creativity. I like the Lego City set and would like the coast guard. The Death Star is my favorite. LEGO City - Coast Guard! I like the "Lego Brick Box". We LOVE all the Star Wars Legos, but I think the #7621 Indiana Jones and the Lost Tomb would be FUN! Love the Princess' Palace!! My daughter would love that! My grandson would enjoy the Lego City front-end loader. The Princess Palace is great. Thanks. From a fellow mom of nothing but blue in which legoland resides in my house, the boys love the new power miners and want the crawl digger. My son would love Lego set # 3834 Good Neighbours at Bikini Bottom. Thanks for the contest. I like the Bob the Builder: Scoop and Lofty at the building yard. I like 10178 AT-AT™ Walker. My son is crazy about legos! He has every one of the Indiana Jones sets and almost all of the Spongebob sets, and the Agents, lol :) Myself, I love the spongebob sets! My son loves Star Wars, so I know he would love Darth Vader's TIE Fighter. At our house the Bionicles by Lego our a huge hit. The boys love building them, and then displaying them. My kids would love anything from the construction line of products. Thanks for the fun giveaway! My son would totally dig this! The Indiana Jones set is pretty big here...Thanks for the giveaway! My grandson loves all Lego Star Wars! I really like item #7621 - Indiana Jones and the Lost Tomb. I like the 4WD with Horse Trailer. Everyone in my house loves to play with Legos! My sons would love the Clone Trooper sets! I love the Indiana Jones Motorcycle Chase! Thanks for the great giveaway! I can't decide which I like better - the Pirates or the Castles. They both look great. 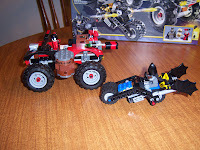 LOVE LEGO'S I LIKE THE INDIANA JONES MOTORCYCLE CHASE! THANKS FOR THE GIVEAWAY! The Thunder Driller looks cool. Legos are the best toy! I want to play with the Medieval Market Village set myself! The Brickbeard’s Bounty looks awesome!!! Thanks! I liked the Brickbeards Bounty set. My kids love all things Pirate! I like the Clone Walker Battle Set. My favorite is the Darth Vader's TIE Fighter! It's all about the gigantic Star Wars one with 5000 pieces! I won't lie. My son is 9 months old. I want to win this for my husband! He loves legos and Star Wars! He would really like any thing Star Wars or Batman. Any of the Star Wars legos - my sons would love those! My grandson would love the Star Wars legos. I like their Modular Houses from the Lego Factory/. In my family, Legos are a huge hit! The boys especially love everything in the Star Wars line. I like the Indiana Jones LEGO sets,allof them. My sons will play and not fight for an hour or so. Thanks for hosting this cool giveaway, I think they'd love the Hammer Truck set too. My favorite is the DUPLO® Deluxe Brick Box. Thanks for the giveaway!